When November rolls around, I like to be warm and cozy. My favorite place to be is on my couch, wrapped in a blanket with warm, carby, comfort food (preferably something with lots of cheese), watching movies. But staying physically active throughout the colder months is very important. Benefits to consistent physical activity include improved mood, increased energy, reaching and maintaining a healthy weight, and a better night’s sleep. Here are some things you can do to get off the couch and get moving in November, and some bonus tips to help you fuel your body! 1. Train for a race! Area races and fun runs don’t stop when the leaves fall. 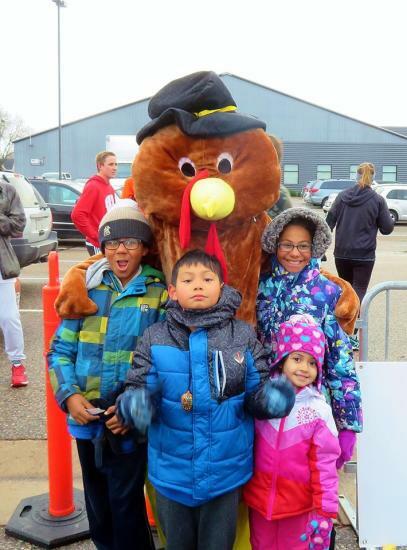 One of the most popular races of the year occurs every year on Thanksgiving Day-the Festival Foods Turkey Trot! A fundraiser for the YMCA and Boys and Girls Club, The Turkey Trot offers a five-mile run, a two-mile walk, and a two-mile Dog Jog for dogs and their favorite people. Just think of how extra delicious your Thanksgiving dinner will be after running five miles! You’ll definitely deserve an extra piece of pie or two! For more information on the Festival Foods Turkey Trot, and to register, visit their website. 2. Try a new fitness class! Eau Claire has it all: Zumba, yoga, PiYo, even pole dancing! 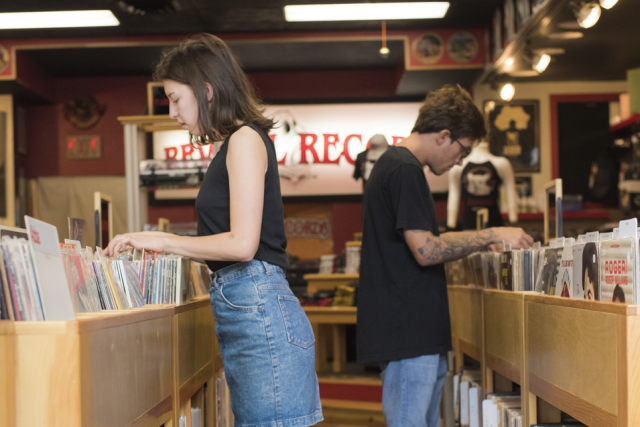 You’ll find many local businesses offer drop-in classes and punch cards with no commitment, and with flexible hours to accommodate any schedule. Dragonfly Wellness in Downtown Eau Claire offers something for everyone from yoga to pole dancing. Pure Fitness 4 You on Hastings Way has a wide variety of classes including PiYo and Barre. 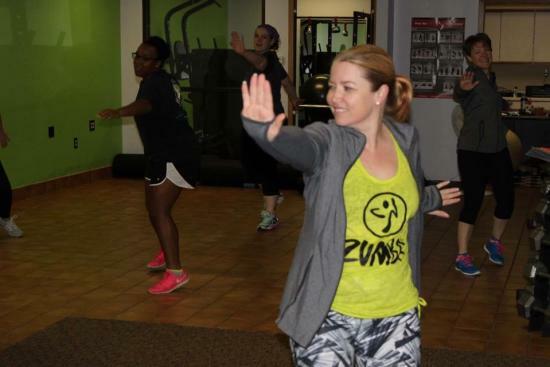 Zumba fans will enjoy classes in Eau Claire and Chippewa Falls with PS-Get Fit, LLC. With all the fun options available you can try a different class every day of the week! Thanks to the Internet, nobody needs a gym. Workout videos of all kinds can be found on YouTube, both free and subscription services. You can also find all kinds of options at www.fitnessblender.com. Enter the type of workout you’re looking for, how long you’d like it to be, intensity, and area of focus, Fitness Blender will give you workouts to choose from, at no charge. 4. Take activity breaks throughout the day! The Wellness Coaches at Group Health Cooperative of Eau Claire offer great tips on how to incorporate fitness activities into your daily life, at home and at work. Visit the Coaches’ Corner blog for recipes, workout tips and encouragement from Wellness Coaches like Sarah D-P, who shared a fun way to burn some calories while keeping tabs on your favorite team during football season, and Coach Joanna, who shared a 30 Day Squat Challenge that you can do anywhere. Grab family and friends and head to Action City at Metropolis Resort. Jump around in the trampoline park and try your luck at bowling and laser tag, or embrace your inner child at the indoor playground. Visit Action City online or in person to see the variety of packages available. Don’t forget to nourish yourself to stay energized through all this activity! Visit Just Local Foods in Downtown Eau Claire for groceries and recipes to make healthy, delicious meals and snacks. They carry many organic and fair trade products, including meat, produce, dairy and coffee. What are your favorite ways to stay active during the chilly weather? Share them with us on social media, don’t forget to tag your posts #caputreec!